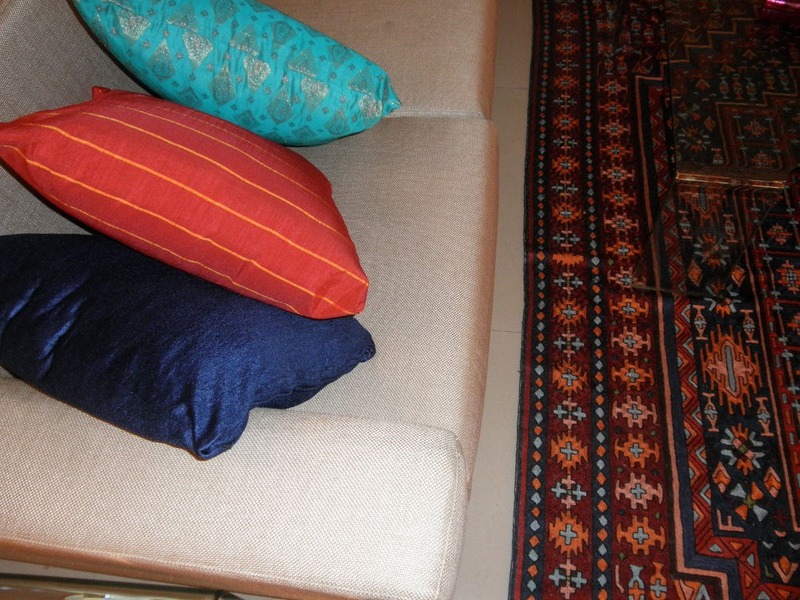 I picked the blue, red/orange stripe, and turquoise/gold from memory, and they work, even in spite of my equivocal photographic skills, and the flash-wash that makes the red pillow look paler than in real life. There are six pillows in total, two of each fabric. It’s growing into a feral, interlaced dahlia of a design, which you can begin to see in this rough pin-out. Additional width will be more of the same. Maybe I’ve ridden at liberty for too long, working at whim instead of direction. Maybe I’m too much of a tinkerer to do a stitched design laid out by someone else, or I have a touch of compulsive perfectionist in my soul – but for whatever reason, this kit is already driving me nuts. Don’t get me wrong, it’s a complete kit, thoughtfully laid out and as a reproduction, extremely well documented. The unruly element is me. 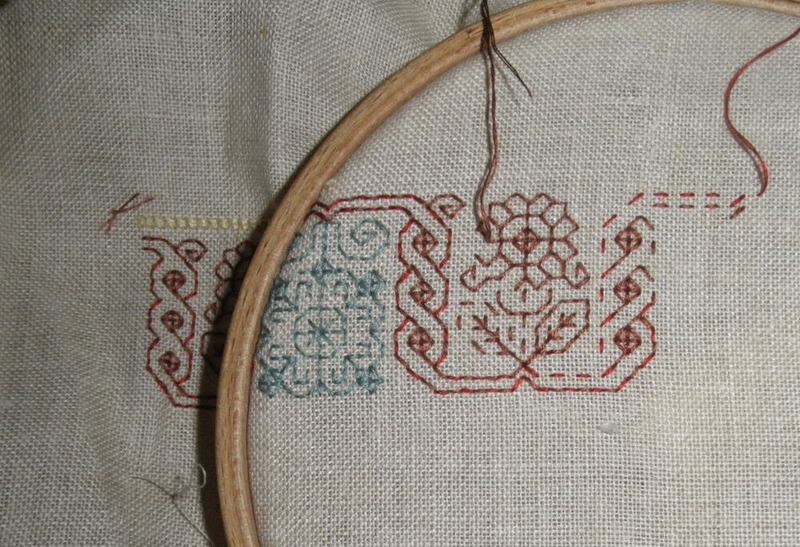 For example, it pains me to mindlessly duplicate the mistakes laid down by the original stitcher. See that twist column to the left of the frame? That’s verbatim to the pattern’s directions. But I tried, and tried, but just couldn’t let it sit that way. See the twist inside the frame, with the completed centers? I **had** to do it. I’ll probably pick out the offending imperfect twist and re-do it to match the edited bit. There’s also working up the double running for this panel in two colors of sienna. The blue flower doesn’t bother me, I find that adorable. But using two threads for the framing spiral, alternating colors is maddening. It’s clear to me that dear Sarah might not have marled and finger-spun her threads properly, or perhaps ran out of one of the two shades, and that’s why the panel is done in alternating two-tone. It’s all I can do to grit my teeth and work as directed, because if I don’t, I risk running out of a color before the kit is done. Getting more matching thread, especially here, would be difficult in the extreme. And then there’s the format of the charts. They’re huge, and orchestrate a stitch for stitch path, with every single one numbered. There are sufficient map pages in the thing to chart one’s way from Boston to Mumbai by rail (including the sunken parts via Atlantis). Paging through them is an exercise in where-the-heck-is-page-2b-left-got-to-now?” – then finding it under the sofa. I’m also not fond of the indicated stitch logic. The paths described are not the ones I would choose. I tend to key off established bits, so that I can proof new sections against clean counts as I work. There’s too much “where no man has gone before” in this piece, with extremely long runs worked in advance of the growing body of work, and no way to confirm fidelity as one progresses. Is there a moral to this story? Perhaps, not. But I have to admit that today’s post reveals that I’m a ruthless stickler for detail, caught up in color matching from memory, precision adherence to knitting patterns (where forays into originality are better left for after one has grokked the source design); but temperamentally incapable of similar fidelity to oh-so-obvious stitching directions. Mark it up as another character flaw, pass me a glass of wine, and move on, please. I totally agree and have never understood why there are alternating colors in some of those bands, it has never made sense to me either. Your pillow colors are beautiful and seem to add a splash of color in a combination I wouldn’t have though to use. I love color but my living room is stuck in rich brown (leather sofa set), tuscan yellow, dark green, and burgundy. Bright colors scare me, but I like them, I am just not brave enough to use them, lol. Well, think of Sarah’s feelings too. Wouldn’t you be a little embarrassed if people kept copying your embroidery mistakes on purpose? I love that rug! and have so enjoyed your posts. I’m not surprised you are test driving Mmario’s lace pattern. You love working without a net! It’s nice to see that lace weight yarn finally being used. I fully understand your frustration with the Sarah Sampler. I suffered some of them when cleaning up charts for “Flowers of the Needle” There were some obvious typos in them, due to their being woodblocks. The fingers itch to correct. 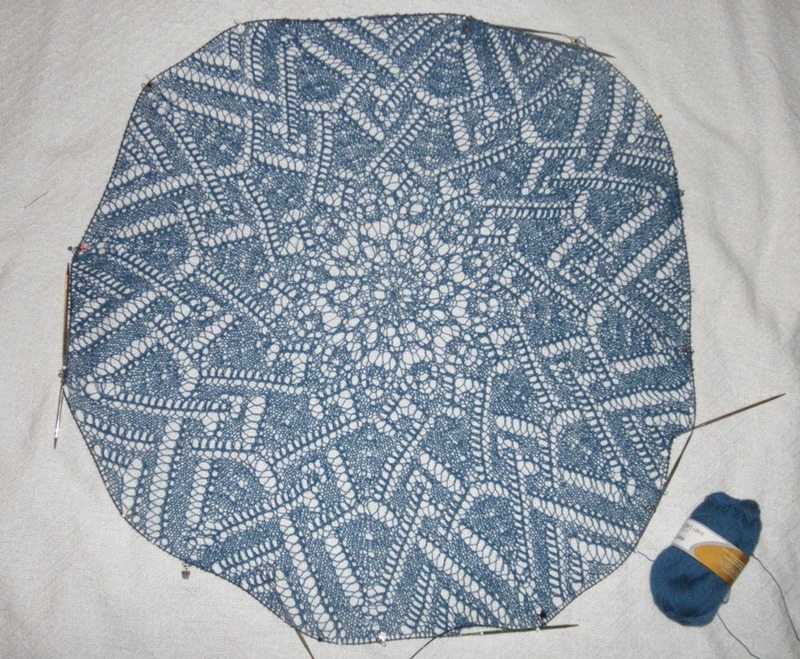 My impression is that sampler mavens want it done, mistakes and all. I am relieved at the mistakes. I saw so much gorgeous embroidery at the V&A done by little girls that I felt very inadequate. Part of what has scared me from trying double running is those long expanses you mention–what if they don’t line up? It seems saner to work section by section as you do. The kit sounds like it was made for scairdy cats like me. Oh Kim! I’m laughing as I read your post! I’m the same way, can’t stand to leave in the original stitcher’s mistakes. What makes me really crazy is when the person who reproduces the charts claims that it is an “exact reproduction” of the original sampler, and when I study the photograph of said sampler, there’s an extra squiggle or flower that the designer did not include in the chart! Or, and this really drives me insane, the designer does not include all the pattern repeats of the band in the original sampler. As for running out of color, I don’t worry about it. Ever since our DD’s fat cat ate exactly 1″ off the ends of each of my hanks of silk (really colorful litterbox the next day), I just say, “Oh well”, and go to the LNS and purchase the closest match to what I have. After all, the colors in the original samplers have faded over time, they’re separated by many rows of stitching, and unless the personI studying it is a stickler for details like us, who is going to know? I am a double running stitch addict. I have loved the stitch ever since I was a child. I love the long runs, the bands worked in two colors, the intricate detail of the patterns, and I can hardly wait for your Second Carolinigan Modelbuch to be published!! !